I seem to have an odd karma thing going on with trees. Some of you may remember my ordeal with removing a couple of trees from the backyard of my old house about two years ago. It is chronicled in my archives beginning with Log Blog in August of 2004 and concluding with Finishing a beginning on June 21, 2005. Ironically, here it is almost a year later and trees continue to mess with me. Last Sunday I was standing in my kitchen trying to remember why I was just standing there and I heard the plaintive meow of a cat. This is not unusual since we have three of them and two are quite vocal. I assumed that one was in the garage and now wanted to be in the house so it could then wish that it was back in the garage. If you have cats, this makes sense. I opened the door to the garage and two of the cats sat on the hood of my truck staring at me indignantly. Neither was meowing. The third cat was upstairs in our bedroom. I now realized the meowing was coming from outside. By this time, Tess had joined in the search for the source of the feline cry for help. We traced it to a large pine tree in our backyard. There, in the crook of some branches about 15 feet above the ground was a beige cat. One of Tess' endearing qualities is her compassion for all creatures. She immediately started talking to the distressed cat and told me to go get a ladder. Having dealt with cats in trees before, I wasn't enthusiastic as I pulled the ladder out of the garage and leaned it next to the tree. "No good deed goes unpunished," I told Tess as I climbed the ladder toward the cat. The cat immediately stopped crying and started climbing. I know the thing was scared, but I've never understood the cat psyche when it comes to trees. They climb them easily enough, but they never seem to be able to comprehend "reverse" and figure out how to come down. I pulled myself higher on the ladder and made a grab for the cat. It's tail passed through my hand as it darted another 10 feet up the tree onto some very thin branches. I backed down the ladder and told Tess that the cat would come down when he was hungry. Tess went inside and filled a small dish with catfood and placed it under the tree. I'm pretty sure the cat couldn't see it or smell it from where he was, but Tess' heart was in the right place. Later that evening, I stepped out on the patio to cover up my grill when I noticed a very large raccoon finishing off the bowl of catfood. It dawned on me that the raccoon had probably been the one who scared the cat enough to go up the tree in the first place. I further reasoned that the raccoon did this knowing the cat would be stuck there and someone would put food at the base of the tree to try to lure it down. Then the raccoon would eat the food. Raccoons are clever like that. 1) The fire department does not rescue them. They will give you their pat answer, "Have you ever seen a dead cat in a tree?" My response is, "No, they fall out when they die." 2) Animal shelters do not rescue cats from trees. 3) Utility companies do not rescue cats from trees. 4) Tree services may rescue cats from trees, but only if you pay them to and they prefer to do it by cutting down the tree. Then you are stuck with huge rounds of wood that are near impossible to get rid of. Trust me on this one. 5) Hunger and thirst do not seem to be primary motivators for cats to come down from trees on their own. 6) No one actually knows how to get a cat out of a tree. Monday came and the cat was still stuck up in the tree. Monday was also one of the hottest days we've had in Seattle in a long time. The cat stopped meowing and just hung their morously on a branch. I knew that Tess couldn't just stand by for much longer and watch the thing suffer so I dug out the ladder again, donned protective clothing and went once more into the tree. But this time I left the ladder and pulled myself up into the branches as close as I could to where the cat was. It moved further away. While Tess watched from below, I shook the branch assuming that frightening the cat to death would be better than it dying of dehydration in the tree. The cat didn't budge. I attempted hooking the branch with a push broom to try and pull it toward me so I could grab the cat. This aggitated the cat and it began to hiss at me. I climbed back out of the tree and down the ladder. The cat spent yet another night in the tree. Tuesday came. The cat had actually moved from the one pine tree to an adjacent pine tree. It had worked its way out on a very small branch that hung over the parking lot of an apartment building next to our house. I gave up on the notion that the cat was coming down, at least on its own. I got the ladder one more time and asked Tess to grab a towel and stand under the branch the cat was one. I climbed the ladder with a box saw and with my left hand, mind you, I began sawing the branch the cat was lying on. In about five minutes the branch cracked and swung down toward the ground. The listless cat immediately became quite animated and leapt off the falling branch. It hit the ground running with Tess on its tail calling for the cat. It ignored her and darted across the street (thankfully not getting hit by a car) and hopefully home to a full bowl of food and water. Later that evening, I stood under the tree staring up into the tree, half thinking I'd see the cat back up in the branches. 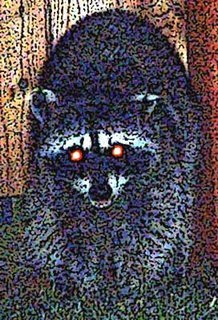 Instead, and I may have just been halucinating, I swear I saw the face of a racoon. And I'll be damned if he wasn't laughing. I've had my share of cat in a tree encounters. They usually end with the cat safely on the ground and me desperately trying to staunch the flow of blood from the various scratches I earned for my efforts. But if you're gonna have cats you have to expect some scars to go with them. I wonder if squirting the cat with a water hose would have worked? At the very least the cat could have gotten moisture from licking its fur. This is the fourth time I've rescued a cat out of a tree. The first three were my own cats. I'm not sure where this cat came from. I doubt if I will see it again, however. R. I thought of the spraying the cat with a hose, but I was concerned with it being knocked out of the tree over the parkign lot. Sawing the branch off seemed the safest solution. I don't think I've ever seen the word "beige" used in application to a cat. Upholstery, yes. Interior paint, definitely. But cats? Have you been ordering yours out of a catalog (get it? CATalog?) or something? Huh. Was the racoon heathered grey with black accents? But good for you for helping the kitty (and your wife for guilting you into it!). I always pegged you for an animal lover. Still smarting over the fact that I dissed the Bacon Bowl, aren't you? Regardless, the cat could also have been described as a light, burnt sienna if that is more acceptable to you. And once again, it wasn't my cat. I helped it out of the goodness of my heart and I was sick of hearing it meowing. The raccoon was more of a salt and pepper gray with beige accents. It was kind of dark when I saw him. Awwww you are too sweet for words! Thanks Cherish, unfortunately the cat didn't think so when I was sawing the branch. great story Tim. I don't know if I would have gone through such great lengths for the cat. I would have tried the hose. could that have been the same branch as spoke of in the book of Isaiah, the one being from the stump of Jesse? perhaps cats use the 'woo is me i am stuck' attitude to see how far they can entice the humans to climb??? Perhaps they go off laughing .. at the antics of the silly humans?? which is all to say - maybe the cat had reasons to be in that tree crying .....like a broken heart... a practical joke?? Thanks Shandi, You are obviously a more learned Biblical scholar than me. As far as I know it just a Pine branch, but it did put the fear of god into that cat (and some sort of movement). Interesting theories on why the cat was in the tree. Personally I just think it was stupid.